My dog hates my baby. OK, hate is a pretty strong word. But our plot hound, Lulu, definitely isn’t trilled with this tiny new person taking up all her mom and dad’s attention. 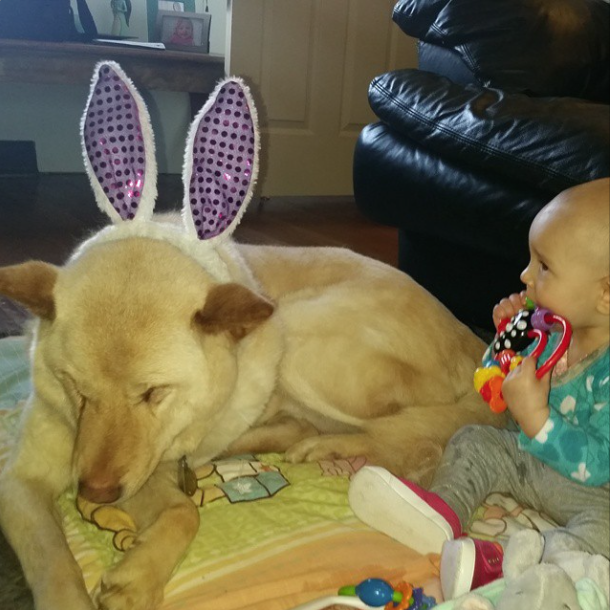 During my pregnancy, I worried about how our dogs would react to a new baby. I expected our female dog, Lulu—who was basically used as a breeding machine before we rescued her—to be nurturing with our new addition. I figured our boy dog, Lucky—the resident hunter of small animals—wouldn’t look twice at her once he realized she wasn’t game. I also worried about hurting their feelings. I didn’t want the dogs to feel neglected or unloved just because we welcomed a new, amazing family member. But it happened. Playtime: Lucky and Baby G.
It turns out that Lucky is obsessed with Genevieve and has basically taken on the role of her guardian. He is always in the same room with her. In fact; whenever he comes in from outside, the first thing he does is run from room to room until he finds Genevieve. Lulu, on the other hand, has wanted nothing to do with Genevieve from day one. She became depressed and stopped eating her regular amount of food. Whenever we tried to sit next to her with the baby, she would get up and go into another room. My husband made sure to give her extra attention and continue her daily walks, but winter came and walks became few and far between. That made for one sad hound. We never forced Lulu to love Genevieve. It’s something she has to learn on her own, little by little. 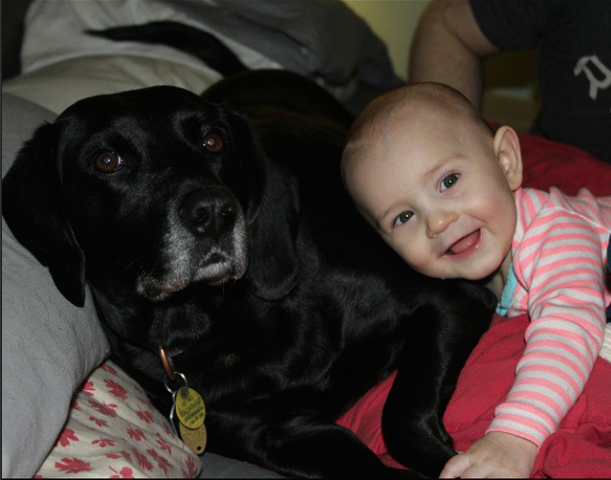 I would also never put the baby in a situation where she was in the face of a dog who didn’t like her. Lulu doesn’t have a mean bone in her body, but it’s still not a chance to take. Girls just wanna have fun? Baby G sure does. Lulu is pondering the idea. Genevieve is now nearing eight months old and we’ve made a ton of progress. Lulu will let the baby pet her and even kisses her sometimes! She’s still a loner, but I have a feeling once Genevieve starts walking and dropping crumbs of food, Lulu will become her BFF.